1407 has rewritten all of the rules of antagonistic traits. 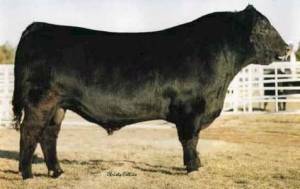 His EPDs are some of the most exceptional in the breed in every trait, yet he is considered a "heifer acceptable" sire. Rarely do you find such a performance bull that owns good carcass and maternal traits, too, but that is just what 1407 brings to the table.